I know what you’re probably thinking. 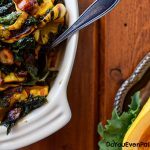 “Warm winter kale and delicata squash salad? Really?” I know. It sounds like I just ran out of ideas and threw some foodstuffs together hoping no one would notice how weird they are. That’s not that case. This is a damn good salad. After spotting the idea for a warm kale salad online, I decided to utilize the ingredients I had on hand to make a salad I could bring to Thanksgiving dinner. Surprisingly, I didn’t get thrown out for bringing a salad to Thanksgiving. More surprisingly, people ate my salad and legitimately liked it. So much so that they went back for seconds. At that point, I knew I had to recreate the recipe and share it here. 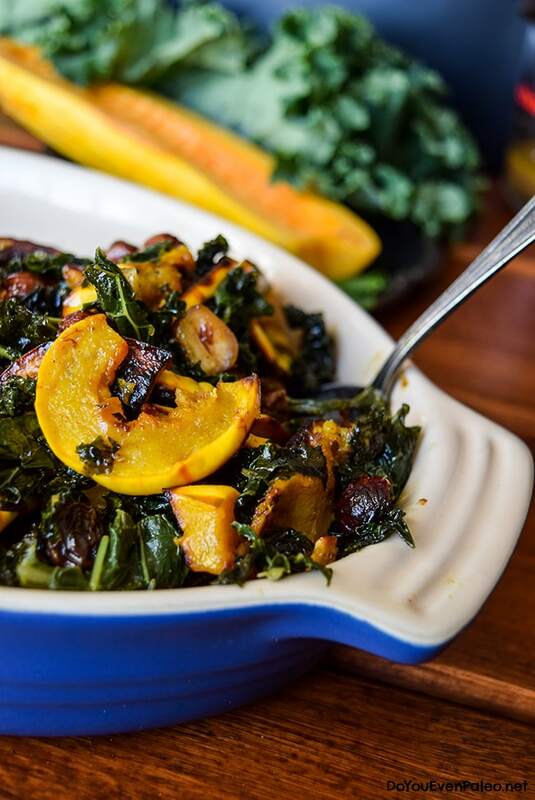 Wilted kale, delicata squash, toasted hazelnuts, and raisins all working together to create a cozy, delicate bite that’s full of nutrition. The maple vinaigrette just ties all the flavors together. 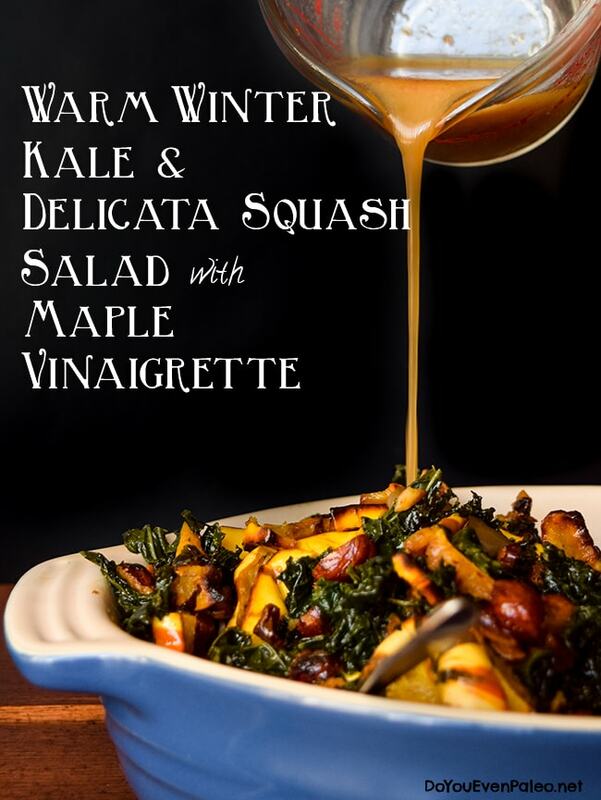 You’ll forget you’re eating greens and get lost in the flavors of winter! One of my favorite things about this recipe is that you can prep it in advance. I don’t mean just one part of the salad can be prepped the day before and you have to wait to dress it later. Really, you’re supposed to make the entire thing a day or two in advance to let the flavors combine—dressing and all. Typically, salads are very challenging to prepare ahead of time because you risk them getting soggy and gross. But for this salad, the kale is cooked so there’s no concern about sogginess. Being able to make this salad before you need it makes it perfect for dinner parties, potlucks, or weekly meal prep! I’ve got to admit, I ended up rushing the pictures of this recipe just so I could dig in. And I ended up eating the entire batch in one sitting. Enthusiastically eating a massive salad for any reason means it must be good, so even though I’m not thrilled with how the pictures turned out, I knew I had to bring it to the blog as soon as I could. Hopefully that’s okay with you. When making this recipe, I line a baking sheet with parchment paper and use it for all three rounds of roasting – the kale, the squash, and the hazelnuts. Less cleanup is always a bonus! Better yet, roasting is the hardest part of this recipe. Once everything’s had its turn in the oven, you simply toss it all together and mix with the dressing. Then leave it in the fridge for up to 5 days until you’re ready to serve! A quick, 20 second spin in the microwave warms the salad up for serving. Preheat oven to 400°F. Toss squash with 2 Tb olive oil. Arrange in a single layer on a parchment paper-lined baking sheet. Bake for 20 to 30 minutes, until squash is tender and browned at the edges. Remove from oven and allow to cool before transferring squash to a large bowl. Meanwhile, prepare kale for the oven. In a large bowl, massage kale with 1-2 Tb olive oil and season with salt and pepper. Transfer to the baking sheet used to bake the squash. Bake for about 10 minutes or until wilted and crisped at the edges. Transfer to the bowl with the squash. Roughly chop the hazelnuts and combine in a bowl with cinnamon, paprika, nutmeg, clove, and cayenne. Add 1 Tb olive oil and toss to coat. Transfer to the baking sheet and bake for about 5 minutes to toast the nuts. Let cool slightly, then add to the kale and squash. In a small bowl, whisk together the maple syrup, mustard, and vinegar. Slowly drizzle in the remaining 1/4 cup olive oil while whisking constantly. Add raisins/cranberries to the bowl with squash, kale, and nuts. Drizzle in half of the dressing and toss. Taste, and add additional dressing if desired. Store in the fridge for up to 5 days. When serving, bring to room temp or warm slightly in the microwave. If you end up with extra dressing, use it for extra salads, toss veggies in it, or use it to flavor cooked chicken. This salad recipe is a really original mix of ingredients and I will enjoy making it and serving it again and again. However, the recipe for the dressing is tragically sweet, tastes like pure maple syrup. I had to add way more vinegar, then lemon juice, garlic, and cayenne to get this dressing to an edible point. 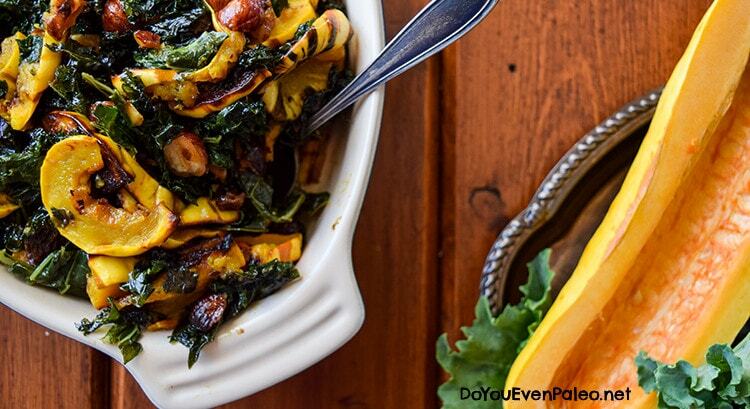 The beauty of delicata squash is its unusual natural sweetness. Leaving out the (sweet) cranberries and using a less sweet dressing really makes this recipe a great dish for delicata’s sweetness to shine. I loved this recipe and substituted toasted pine nuts because that’s what I had in the pantry. I also used a champagne vinagerette with mustard and maple as I also prefer a bit of a tang over the sweet! Thanks for inspiring me to combine my favorite squash with greens for a beautiful fish that can be prepared ahead as well! Love it! Made this for Thanksgiving yesterday and it’s great! I used acorn squash (peeled) and doubled the kale. Delicious! Yum! I also made this for Thanksgiving and it was a hit! Thanks for stopping by, Julia! Don't subscribe All Replies to my comments Notify me of followup comments via e-mail. 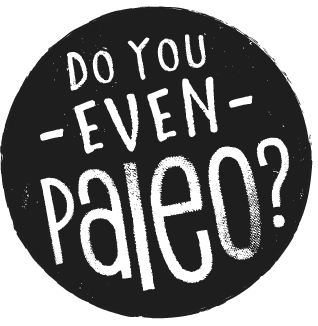 You can also <a href='https://www.doyouevenpaleo.net/comment-subscriptions/?srp=1234&srk=87505361eee98908ddf6ccb8681f50d6&sra=s&srsrc=f'>subscribe</a> without commenting.